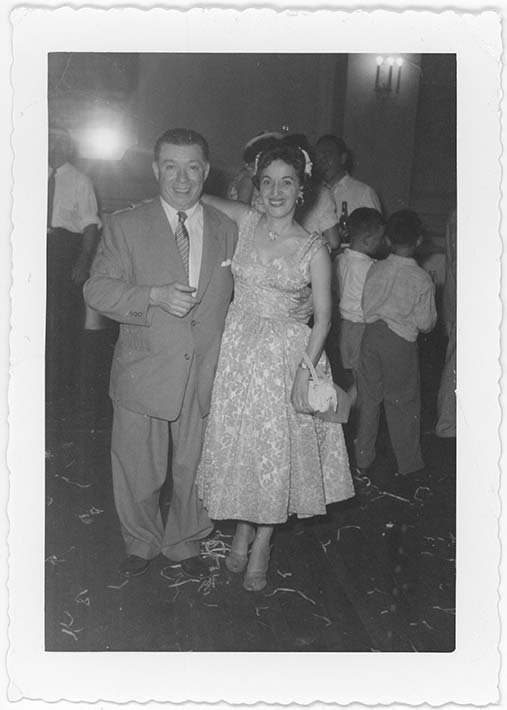 This is a black and white snapshot of Antoinette (Toni) Ciccarelli and her husband Patrick at an event. The couple is shown in full length with their arms around each other. They are smiling straight into the camera. Toni is wearing a light coloured printed dress with a full skirt and thick straps and strappy sandals. She has a decorative hairpiece on her head, round hoop earrings, a necklace, a watch, and a wristlet purse. She has on dark coloured lipstick. Patrick is wearing a suit with a striped tie, and dark coloured shoes. There are other people in the background including children, men, and a woman. It looks like they are in a hall.